Lineage. Designated 55 Aero Construction Squadron on 25 Aug 1917. Redesignated 467 Aero Construction Squadron on 1 Feb 1918. Demobilized on 16 Mar 1919. Reconstituted, and redesignated 55 Pursuit Squadron, on 24 Mar 1923. Activated on 15 Nov 1930. Redesignated: 55 Pursuit Squadron (Fighter) on 6 Dec 1939; 55 Pursuit Squadron (Interceptor) on 12 Mar 1941; 55 Fighter Squadron on 15 May 1942; 55 Fighter Squadron (Twin Engine) on 30 Dec 1942; 55 Fighter Squadron, Twin Engine, on 20 Aug 1943; 55 Fighter Squadron, Single Engine, on 5 Sep 1944. Inactivated on 18 Oct 1945. Activated on 29 Jul 1946. Redesignated: 55 Fighter Squadron, Jet, on 15 Jun 1948; 55 Fighter-Bomber Squadron on 20 Jan 1950; 55 Tactical Fighter Squadron on 8 Jul 1958; 55 Fighter Squadron on 1 Oct 1991. Inactivated on 30 Dec 1993. Activated on 1 Jan 1994. Assignments. U. S. Signal Corps, 28 Aug-Nov 1917; Third Aviation Instruction Center, Nov 1917; Aerial Gunnery School, May 1918; 2 Air Depot, Nov 1918-Feb 1919; unkn, Feb-16 Mar 1919. 2 Bombardment Wing (attached to 20 Pursuit Group), 15 Nov 1930; 8 Pursuit Group (attached to 20 Pursuit Group), 1 Apr 1931; 20 Pursuit (later, 20 Fighter) Group, 15 Jun 1932-18 Oct 1945. 20 Fighter (later, 20 Fighter-Bomber) Group, 29 Jul 1946 (attached to 20 Fighter-Bomber Wing, 15 Nov 1952-7 Feb 1955); 20 Fighter-Bomber (later, 20 Tactical Fighter) Wing, 8 Feb 1955 (attached to 39 Tactical Fighter Group, 31 Aug-23 Oct 1990); 20 Operations Group, 31 Mar 1992-30 Dec 1993. 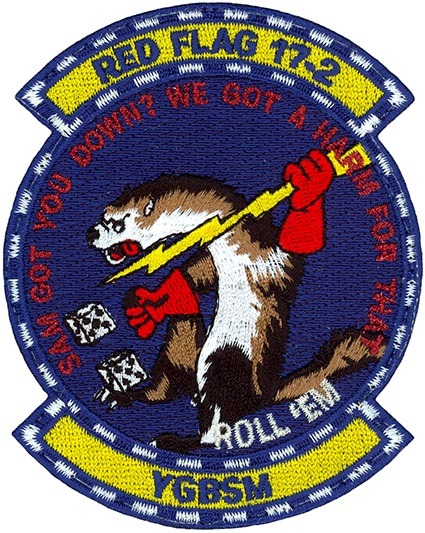 20 Operations Group, 1 Jan 1994-. Stations. Kelly Field, TX, 9 Aug 1917; Hazelhurst Field, NY, 21 Sep-13 Oct 1917; Issoudun, France, 4 Nov 1917; St Jean-de-Monts, France, 16 May 1918; Latrecey, France, 6 Nov 1918-c. 8 Feb 1919; Garden City, NY, c. 4-16 Mar 1919. Mather Field, CA, 15 Nov 1930; Barksdale Field, LA, 31 Oct 1932; Moffett Field, CA, 19 Nov 1939; Hamilton Field, CA, 9 Sep 1940; Wilmington, NC, c. 22 Feb 1942; Morris Field, NC, 23 Apr 1942; Drew Field, FL, 7 Aug 1942; Paine Field, WA, 30 Sep 1942; March Field, CA, c. 1 Jan-11 Aug 1943; Wittering, England, c. 27 Aug 1943; Kings Cliffe, England, Apr 1944-11 Oct 1945; Camp Kilmer, NJ, 16-18 Oct 1945. Biggs Field, TX, 29 Jul 1946; Shaw Field (later, AFB), SC, c. 25 Oct 1946; Langley AFB, VA, 19 Nov 1951-22 May 1952; Wethersfield, England, 1 Jun 1952; Sculthorpe, England, 9 Aug 1955; Wethersfield, England, 27 Apr 1956; RAF Upper Heyford, England, c. 1 Jun 1970-30 Dec 1993 (deployed at Incirlik AB, Turkey, 31 Aug-23 Oct 1990). Shaw AFB, SC, 1 Jan 1994-. Aircraft. None, 1917-1919. In addition to P-12, 1930-1935; included DH-4 during 1931; P-26, 1934-1938; P-36, 1938-1940; P-40, 1940-1942; P-39, 1942-1943; P-38, 1943-1944; P-51, 1944-1945. P-51, 1946-1948; F-84, 1948-1957; F-100, 1957-1971; F-111, 1971-1993. A/OA-10, 1995-1996. F-16, 1997-. Operations. Constructed and maintained facilities (after 6 Nov 1918 in Zone of Advance), Nov 1917-c. Dec 1918. Provided personnel for and helped train new units, 1940-1942. Combat in European Theater of Operations (ETO), 28 Dec 1943-25 Apr 1945. From the early 1960s to 1970, provided ground forward air controllers and participated in close air support exercises with US ground forces in Europe. Gained F-111s in Apr 1971 and trained to conduct conventional and nuclear tactical air operations, primarily through firepower demonstrations and tactical exercises. Provided some aircrews for combat in Southwest Asia, Feb 1991. Replaced the 21 Fighter Squadron on 1 Jan 1994, taking over squadron personnel and A-10 aircraft when the 20 Fighter Wing replaced the 363 Fighter Wing at Shaw AFB, SC. Deployed A-10 aircraft and personnel and later F-16 aircraft after Jul 1997, on a rotational basis to support Operations Northern Watch and Southern Watch in Southwest Asia, 1995-2003. Service Streamers. World War I Theater of Operations. World War II American Theater. Campaign Streamers. World War II: Air Offensive, Europe; Normandy; Northern France; Rhineland; Ardennes-Alsace; Central Europe; Air Combat, EAME Theater. Southwest Asia: Defense of Saudi Arabia; Southwest Asia Ceasefire. Decorations. Distinguished Unit Citation: Central Germany, 8 Apr 1944. Air Force Outstanding Unit Awards: 1 Jul 1956-30 Sep 1957; 1 May 1963-31 Dec 1964; 1 Jan 1965-31 Mar 1966; 1 Jul 1968-31 Mar 1970; 1 Sep 1970-30 Jun 1972; 31 Mar 1973-30 Jun 1974; 1 Jul 1977-30 Jun 1979; 1 Jul 1981-30 Jun 1983; 1 Jul 1987-30 Jun 1989; 1 Jul 1990-30 Jun 1992; 1 Oct 1992-15 Oct 1993; 1 Jan-31 Dec 1994; 1 Jul 1997-31 May 1999; 1 Jun 1999-31 May 2001. Emblem. Approved on 28 Oct 1999.